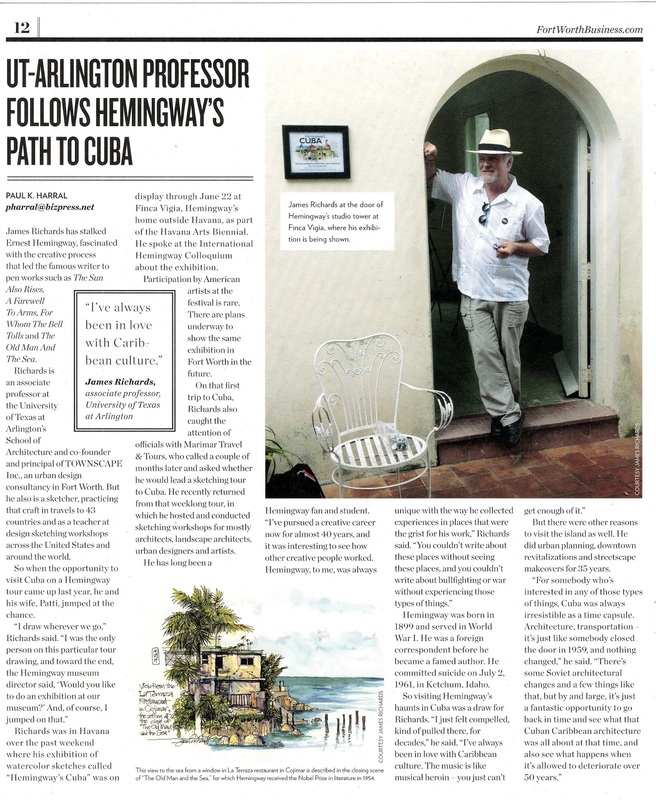 Very pleased to have Fort Worth Business cover our Cuba travels this summer. Veteran Fort Worth journalist Paul Harral did a great job sorting out the sometimes confusing trips and venues, and told the story with style. Thank you Paul and FWB. The pages are shown below as they appear in the hard copy edition. U.S. and Cuban artists collaborate on "Havana Impressions"
While in Havana, our group was honored to be invited to collaborate with renowned Cuban artist Jose Antonio and several other Cuban artists on a collaborative sketch project documenting our impressions of Havana. I was invited to make the first marks, was soon joined by artists James Turner, Veronica Lawlor, Julia Sverchuk​, Margaret Hurst, Tony McDonald, and many others. Jose and his group of artists jumped in, and in the melee of mark making, something magical happened. 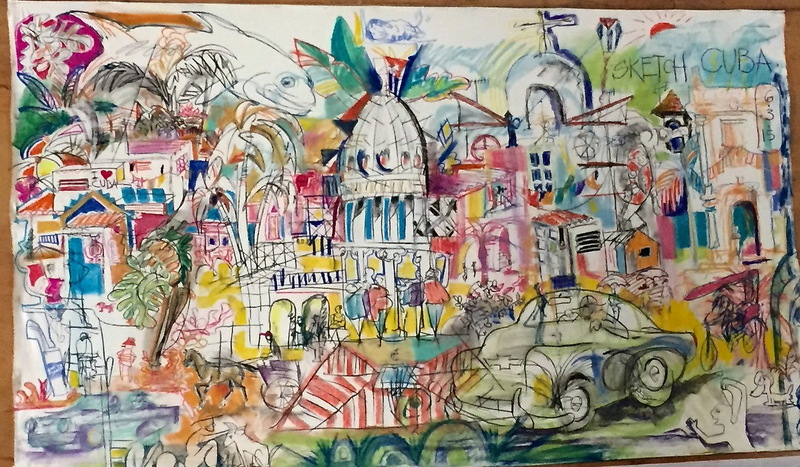 The resulting canvas, being shown now during the Havana Art Biennial, is a priceless symbol of art bridging cultures...and it's a damn handsome image as well. I confer with Cuban artist Jose Antonio before beginning the project. I was honored to be asked by Jose to begin the sketch. I drew a quick image of the Capitolio to act as a centerpiece. 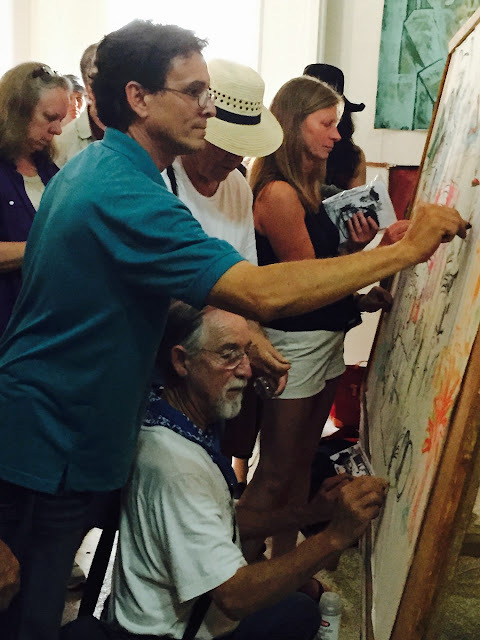 Cuban and American artists who collaborated on the canvas. 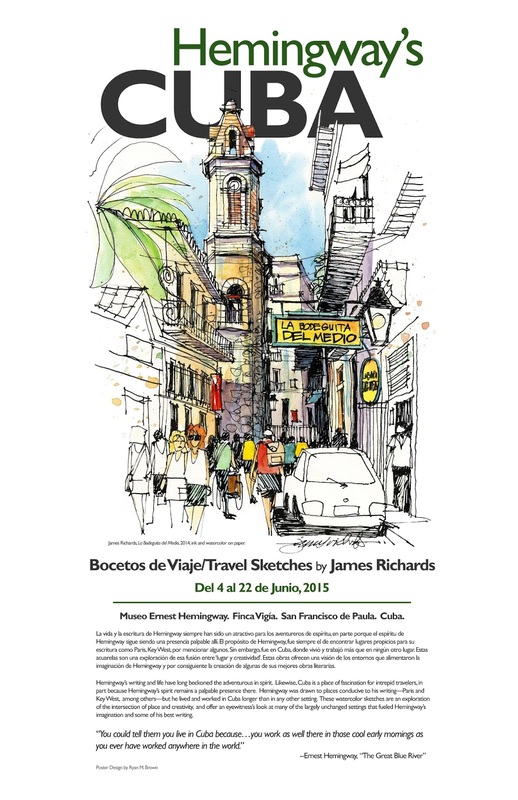 The finished work is being displayed as part of the Havana Arts Biennial through June 22, then will come to the U.S. I'm honored to have participated, and to count this Cuban artists as friends. Our sketchers and kindred spirits experience Cuba's classic American cars up close and personal, with a surprise morning tour of Havana in beautifully restored convertibles. Oh yeah, we drew them, too. At the entrance of Hotel Nacional. Urban sketcher Eve Leonard (right) with landscape architects Lara Moffat (left) and Sarah Kuehn (middle). Dale Sass, my JJR mentor and later, partner. 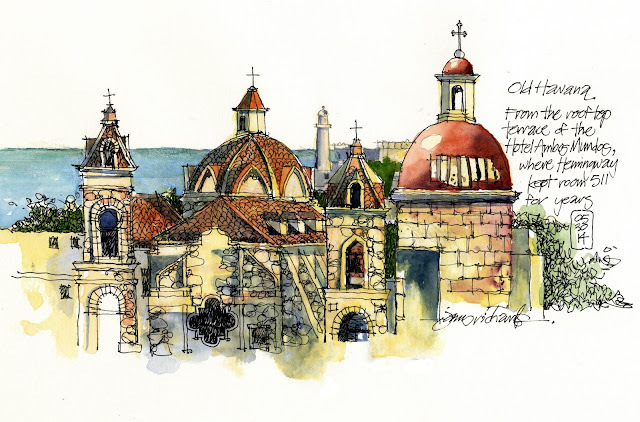 In Cuba I offered short sketching workshops throughout the week, and fellow travelers had the opportunity to sketch in a range of venues in Havana and in the stunningly beautiful Vinales valley. Participants ranged from sketching neophytes to designers hoping to sharpen skills to professional artists and illustrators. It was a very special time of sharing and learning from each other. We had a high-energy showing of sketchbooks at our "farewell dinner" on our last night in Havana. Each day featured an informal workshop; on this particular day we managed to squeeze in two. Here we are in Parque Central, the lush plaza at the foot of famous Obispo Street, and a stone's throw from the Capitolio, El Floridita, Paseo de Prado, and other Havana icons. A sketching workshop at the Plaza de la Catedral in Old Havana. My brother Larry Richards sketching in Parque Central. 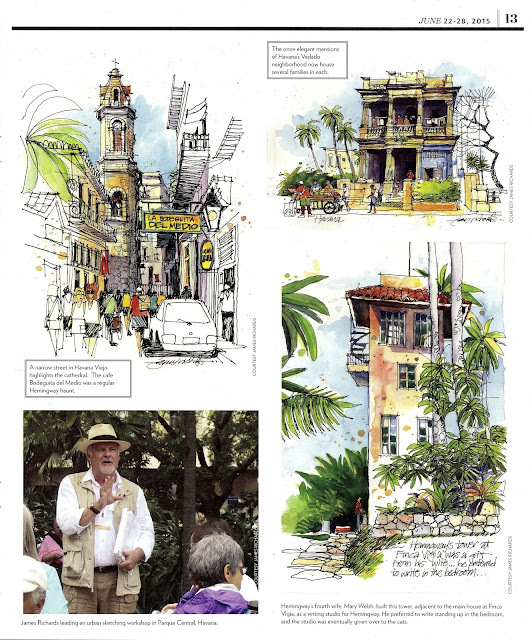 A nice two-page spread by Portland architect and urban sketcher Jason Roberts. An informal sketchbook "throwdown," where sketchers peruse the afternoon's sketches and learn from each other. Conducting an early morning workshop on a terrace overlooking the stunning Vinales valley. 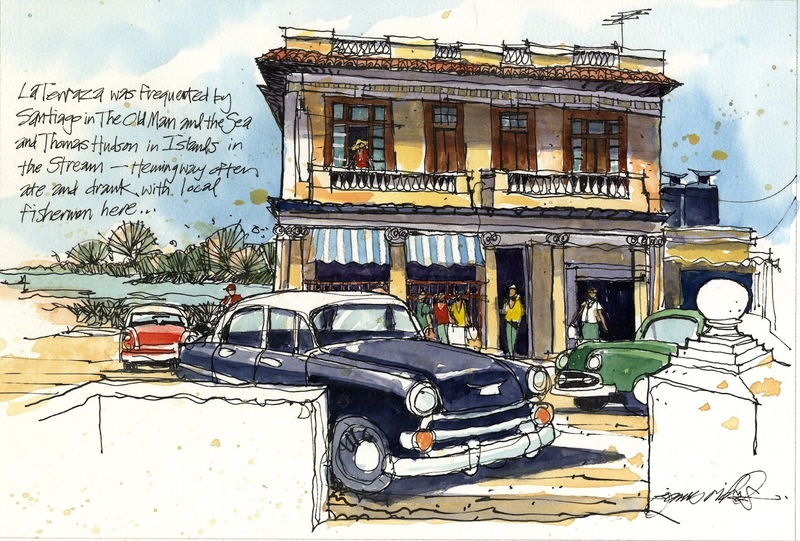 The elegant "farewell dinner" on our last night in Havana featured a high-energy show of the participant's sketchbooks. It may have been my favorite event of the trip. Here are images from my "Hemingway's Cuba" exhibition, and the elegant opening soiree at Finca Vigia, Hemingway's home (now a museum). 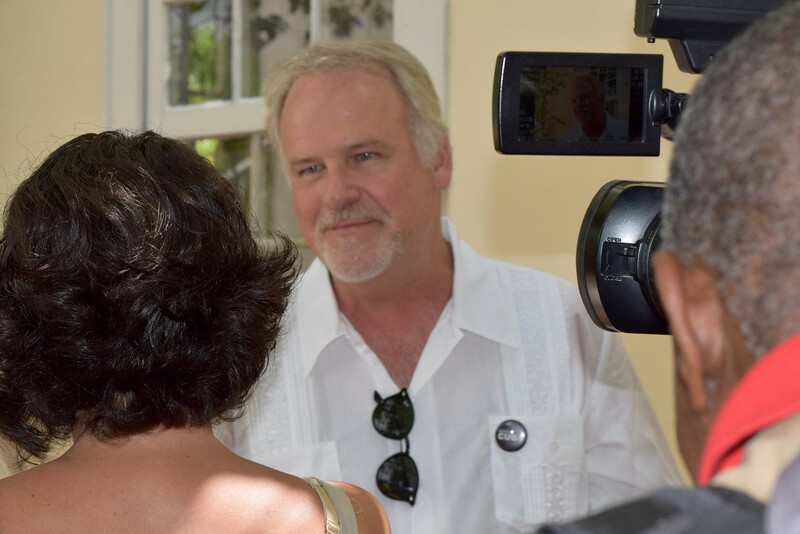 Many thanks to Museo de Hemingway for the invitation to show the exhibition, which will be running through June 22. The exhibition poster, designed by Ryan Brown. JR being interviewed for Cuban national television; translation graciously provided by Maricarmen Sicard, owner of Marimar Travel. 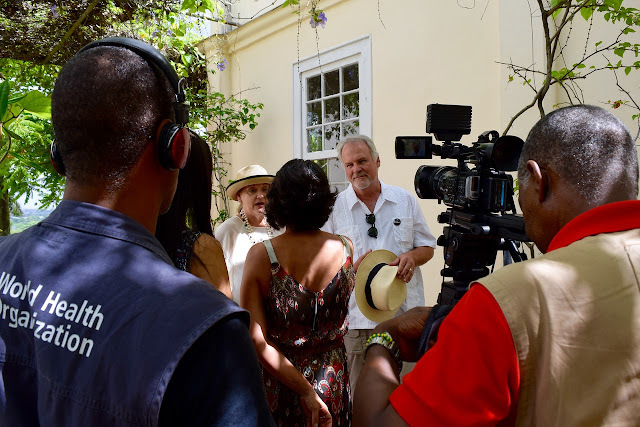 Interview with Cuban national television at Finca Vigia. Door to the ground floor of Hemingway's writing studio, where the exhibition is being shown. Our travel guru and expert on all things Cuba Mayra L. Crespo (left)​ and Museo de Hemingway Director Ada Rosa Alfonso Rosales preview the exhibition. One can't go putting nail holes in Hemingway's walls, so all the pieces were on easels. Attendees of the exhibition opening file through the small room at the ground floor of Hemingway's studio tower. 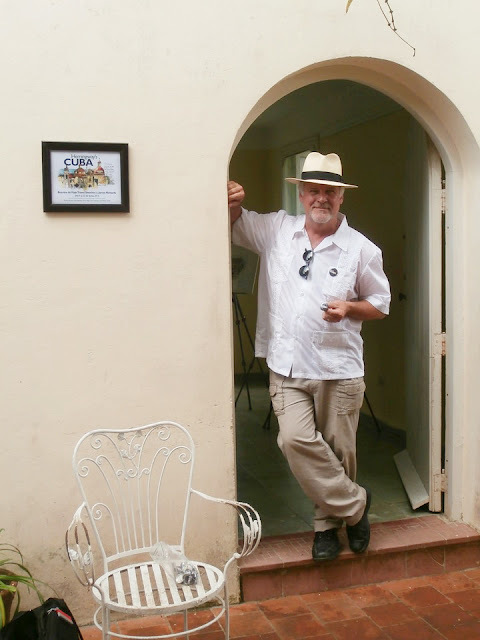 Opening reception under Hemingway's pergola, Finca Vigia. Here's a sampling of pieces from the exhibition, which explores the intersection of place and creativity: the cities, towns, landscapes and experiences that inspire ideas and great works. Hemingway purposefully sought out places conducive to his writing—Paris and Key West, among others—but he lived and worked in Cuba longer than in any other setting. 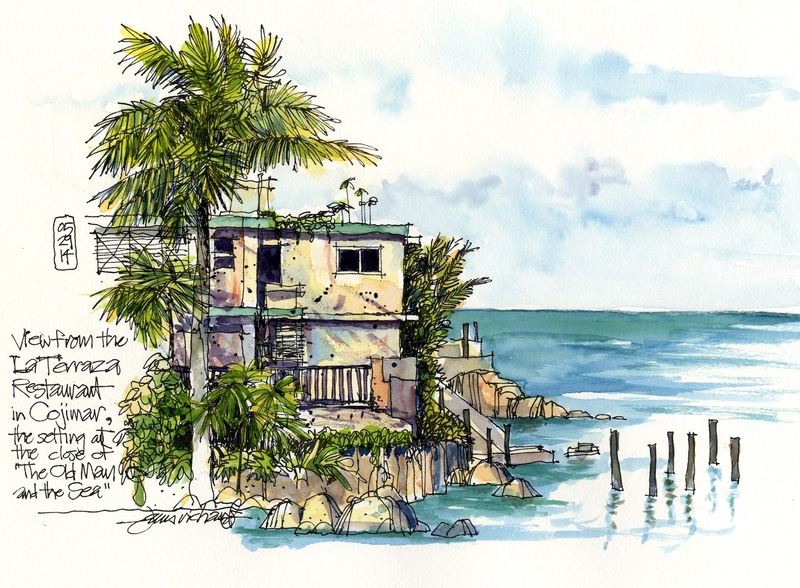 Drawing offered a fascinating way for me to deeply see and experience these locales, and to document a personal response to the places and people we encountered. These watercolor sketches offer an authentic, eye-witness look at today’s Cuba, where past and present intertwine, and at many of the largely unchanged settings that fueled Hemingway’s imagination and some of his best writing. View across Havana Viejo from the roof of the Hotel Ambos Mundos, where Hemingway lived and wrote for several years before purchasing the Finca Vigia outside Havana. La Terraza (The Terrace) restaurant in the small fishing village of Cojimar figures prominently in "Islands in the Stream" and "The Old Man and the Sea." Hemingway kept his beloved fishing boat Pilar at Cojimar, and passed hours telling stories and playing cards with local fishermen. This view to the sea from a window in La Terraza restaurant in Cojimar is described in the closing scene of "The Old Man and the Sea," for which won Hemingway a Nobel Prize for Literature in 1954. 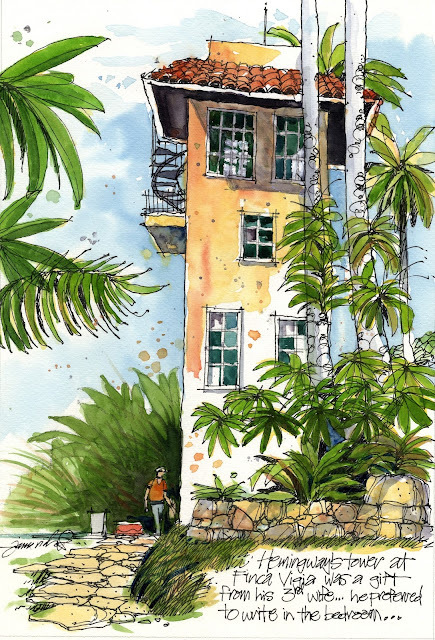 This tower is adjacent to the main house at Hemingway's home, Finca Vigia. Built for Hemingway by his fourth wife Mary Welsh, has a writing studio on the top floor with views to Havana and the sea. The writer preferred to write in the bedroom of the main house, and the studio was soon given over to the cats. 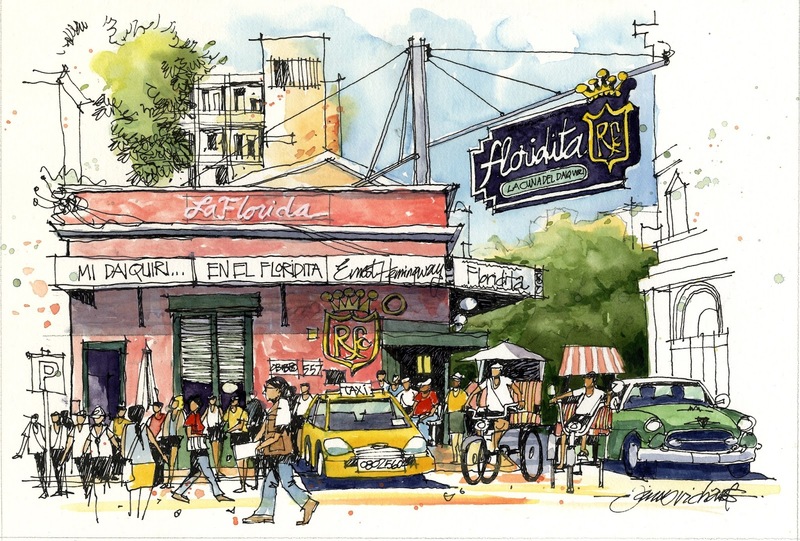 El Floridita is the iconic bar and restaurant in hot, steamy Old Havana, walking distance from the Hotel Ambos Mundos, where Hemingway held court with visiting writers, actors, and celebrities. It is also, according to legend, where he invented the "Papa Doble," a double-strength twist on the traditional frozen daquiri, which the bar claims was also invented here. His record, according to some reports, was 18 at a single sitting.